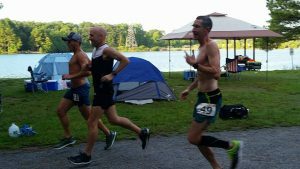 I ran a little race this past weekend. 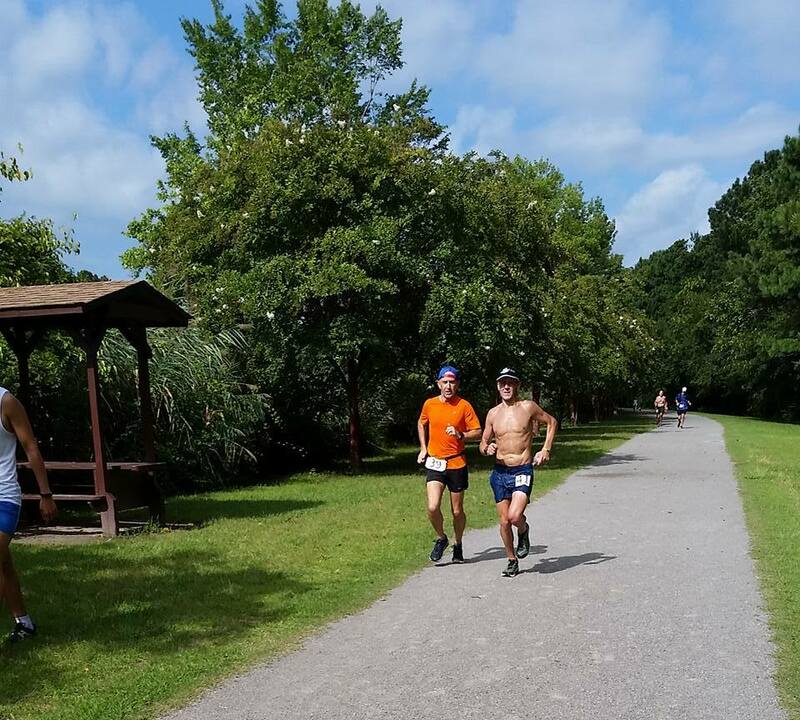 A 12 hour, One Mile With a Smile in Oak Grove Park. Honestly, I am a bit disappointed but thrilled at the same time. If that’s possible. I had a plan and a goal. 2-3 weeks ago, the temps here in Va Beach were sitting in the high 70s, low 80’s with not too much humidity. I actually thought for a minute that would last. I figured, if it stays like this, I could make my A++ goal of 70 miles. I had an A goal of 60.. and a B goal of getting my 2nd longest run ever, so anything over 50 would be good. Race day came.. temps soared. The day before the race, the heat index topped out at 112°. Crap. Well.. lets go have fun I said in my head. I got there and met up with some friends. Roy, Steve, Ally, Chuck, Bridgette, Shawn, Aaron, and well.. quite a few others. I had a plan to stick with my buddy Steve for as long as possible and then go from there. 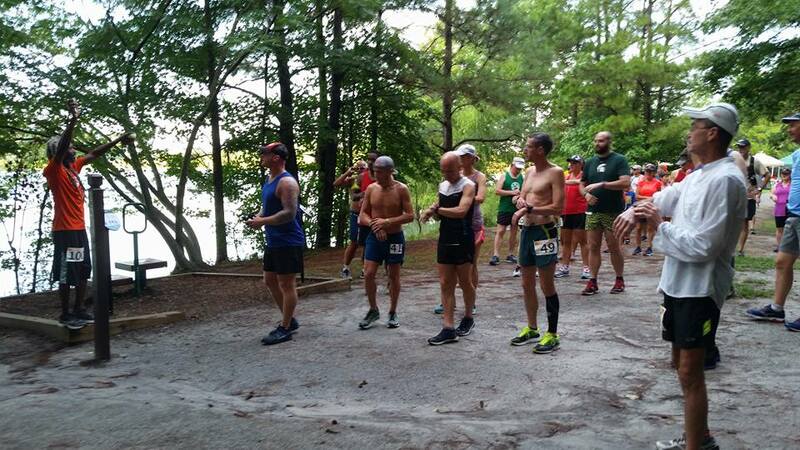 Oak Grove is a 1.5 mile loop around a lake in Chesapeake and is pancake flat. That worried me a bit. 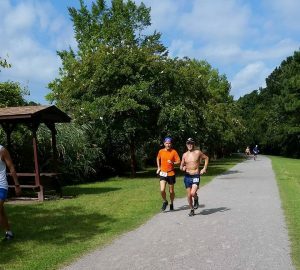 I’m running healthier than I’ve run in years, but I know that is because most of miles have some elevation change in them. Be it at the Jordan Bridge or First Landing State Park with all the side trails. I need some sort of change to keep my glutes and hammies happy and healthy. Thanks to Jake and Dana at Direct Performance Physical Therapy, I’ve learned exercises that have strengthened and corrected my imbalances. I’m in the best shape running wise I’ve been thanks to them, but I know flat surfaces are my kryptonite. The first 18 miles went fast. Steve, Chuck, I just chatted and ran together like any other weekend long run. We laughed as the miles and laps built up. Andrew showed up and ran some miles with us too. Steve and I pulled a bit ahead, going a bit faster than maybe intended, but nothing alarmingly so. Everything was going great.. til it wasn’t. As we got back on the loop to mile 18, I grabbed my Iced Cap and tried to get my body temp down. I was boiling hot as the temps climbed. I stuck with him for a bit, I think another loop at this point, and then decided to walk some until we got around to the checkpoint area. 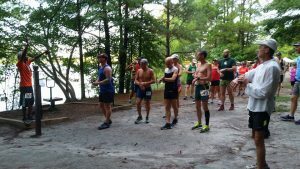 I chatted with the race directors and all the people volunteering. They were awesome, such a well organized race. I walked the next loop as I drank lots of water, probably too much and refilled my Iced Cap with ice. By the time I got around the next loop, I felt normal again and switched out of the Iced Cap. Iced Cap to cool me down! The thing about ultras that most people don’t know. You get a 2nd, 3rd, maybe 4th wind. You get a good high and feel like you can run forever.. then the low hits, and trust me, it will come. Well, about this time, I got out of my funk. I ran the next two laps and was feeling on top of the world until I wasn’t again. I think it was more of a motivation thing than anything. I wasn’t feeling it. Didn’t seem like it was gonna be my day. 12 hours is a long damn time. I was maybe 3.5-4 hours in at this point, so 8 hours or more to go and I was 22-23 miles in. I still had plenty of time to get to where I wanted, but motivation was lacking. Thankfully, I saw Ally at this point. I knew I could probably run more, but I was struggling mentally. Over the next 4 laps with her, in her words, we solved all the world’s problems. 🙂 I needed those laps more than she knows. I saw Steve plugging along, absolutely just killing, and Chuck as well. I wanted to go with them a couple times, but I was having way too much fun chatting with Ally. So I walked with her (and eventually Roy came back) and got back to feeling good. I grabbed some mountain dew and chugged it. wow.. talk about energy kick at the end of the loop. I ran the next couple loops at a good, solid pace. I did stop once to change my shoes, which at this point weighed 20 lbs and once to get something to eat. But it felt good to run again.. until I saw some friends out there. JP had shown up, as did my sister Heidi, and Andrew came back out. I ran those loops on a mountain dew caffeine high. After the comedown I stopped and chatted for a bit. I was going to change shoes again until I saw my feet which looked like I had been in the bath tub for days. So.. I did what JP would do and put on my sandals and walked a lap with him. I also chugged a slurpee that Andrew had brought us all. Don’t think I remember them ever being this tasty, but man, I felt like a new man after that. I got my big boy pants on, changed into some shoes and finished out my 50+ miles. I had almost and hour and a quarter left. I could have gone further. Should have. But.. I was mentally drained. I think timed races are a different beast. One maybe I’m not sure of. On one hand, being able to quit at anytime is nice. But.. that’s the problem. It’s too easy to quit. I like getting somewhere. I don’t like feeling like a hamster spinning around and around in a cage. I think I’ll be staying away from these for a bit. It’s funny to look at my nutrition game plan vs what I actually ate. Tailwind, honey stinger waffles with sunflower seed butter are my norms. Those can power me through lots and lots of miles. Instead, after 20 miles, my diet consisted of potato chips, mountain dew, slurpees and one waffle. I guess you never know what you’ll feel like eating come race day. You practice with one thing in mind, and come race day, it almost disgusts you. Odd that. But you do what you gotta do to get by. I was also shocked at how good I’ve felt since. I’m already back running, taking it easy cause that seems like the smart thing to do. But, don’t feel like I just ran 51ish miles. 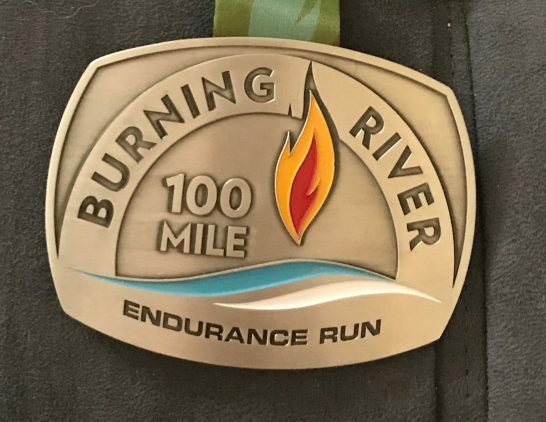 My next race is Nov 11th, another 50 mile race. Being able to run this far in this heat is a huge confidence boost. I’ll be doing some huge back to back long runs to prepare, but I am also hoping to get some speedwork in. I need a little extra something to finish out. I want to have a bit of a kick and be able to hold harder efforts again. 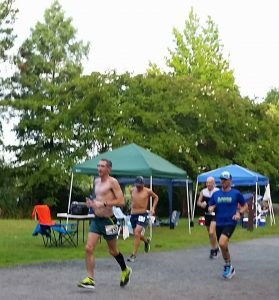 Congrats go out to Steve for winning the 12 hour and setting a personal best of 78 miles. Yikes. 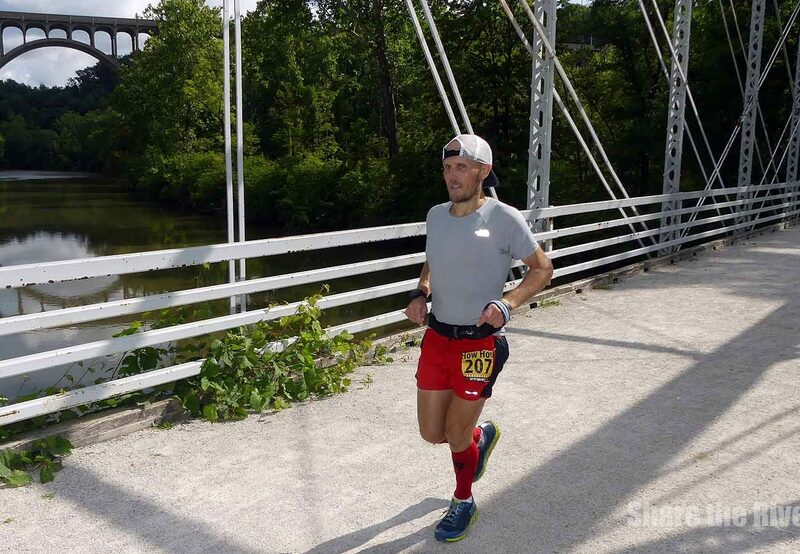 Chuck ran 51 miles, and then crushed a 10 miler the next day, making me feel absolutely lazy. Huge congrats to everyone else that ran and survived in that heat. An amazing day to run and be surrounded by such an awesome running community. Thanks again to Seko and everyone else that put this race together. I hope it becomes a yearly thing.